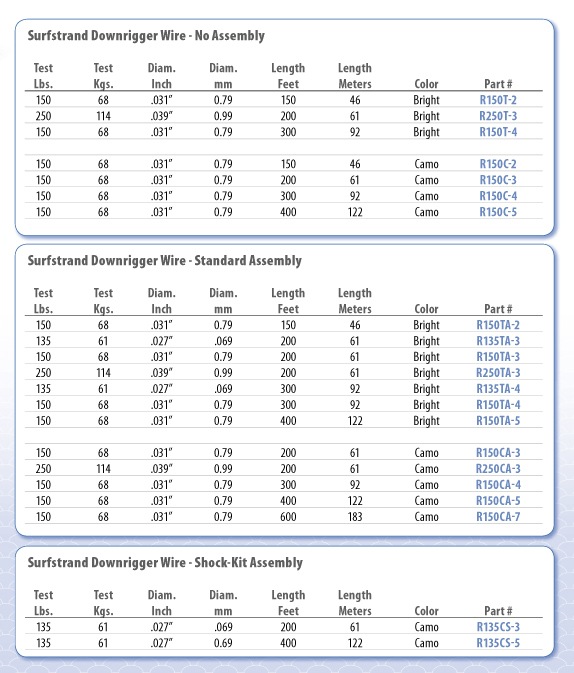 Surfstrand Downrigger Wire is specially stranded 1x7 Stainless Steel wire that provides the flexibility and resistance to bending fatigue required for use on downriggers. Wire is available with and without pre-rigged assemblies. The Complete Assembly includes a stainless steel thimble and a 225 LB (102.3 kg) stainless steel coast lock snap swivel. The Shock Kit Assembly includes a protective spring, two stoppers, and a 225 LB (102.3 kg) stainless steel coast lock snap swivel. Surfstrand Downrigger Wire is ideal for fresh and saltwater use and is designed for all makes of manual and electric downriggers. Available in Bright stainless and Camouflaged Brown finishes.